ABOUT — EDWARD JOHN STEVENS, Jr. When Edward John Stevens, Jr. was featured on the cover of Life magazine in 1950 he was only 27 years old. He was chosen for the cover as an outstanding representative of the up-and-coming artists whose works were shown in an article titled “Nineteen Young American Artists.” At that time Stevens had already had one-man museum exhibitions at the Baltimore Museum of Art (1948) and the Honolulu Academy of Art (1947) as well as six one-man shows at the Weyhe Gallery in Manhattan. He went on to have 24 one-man gallery exhibitions and his works were acquired by many museums including the Whitney Museum of American Art, Boston’s Museum of Fine Arts and the Art Institute of Chicago. Stevens lived and worked in New Jersey throughout his life, studied art at the State Teachers College in Newark and received a Master's degree from Columbia University. His career as a professional artist began in 1943 when he walked into the Weyhe Gallery with his portfolio of works on paper. His work was the hit of the group show in which the gallery placed him and in 1944 his first one-man show was presented at Weyhe. Celebrated personalities who owned paintings by Stevens included Gypsy Rose Lee, the legendary queen of burlesque, Kitty Carlisle Hart and many others. Well-known figures in the design field who were attracted to Stevens' decorative sensibility and collected his works included interior designers Edward Wormley, Eleanor McMillen Brown and William Pahlmann and textile designers Tammis Keefe and Dorothy Liebes. Wormley, Keefe and Liebes, in their own designs, shared with Stevens an interest in ancient and foreign cultures. Like Stevens, they melded this inspiration with rich textures, distinctive colors and a modern aesthetic into a sort of mid-century-multicultural-modernism. Letter from Fleur Cowles to Edward John Stevens, Jr., 1950. Stevens’ strange and delightful works depicted imaginary scenes of archaic cultures adorned with primitive symbols, fantastic interpretations of flowers and animals, and glistening, jewel-like landscapes, town-scapes, and sea-scapes. Stevens was a master of gouache (opaque watercolor) with which he rendered his vibrantly colored and meticulously detailed visions. In a 1947 article in the Newark Sunday News, Stevens was quoted, explaining his attraction to gouache: "I felt gouache was an important medium . . . Since I don't copy nature, I work slowly. To get the effects I wanted with oil would take too long . . . Gouache fitted what I wanted to do." Describing Stevens' gouache paintings, fellow artist and art critic Michael Lenson wrote, in 1955, of the “golden threaded tapestry of his painting technique" while Elaine de Kooning (also an artist) writing in Art News in 1949 noted the “eccentric embroidered effect” of his masterful brush. Allene Talmey, an esteemed writer/editor at Vogue magazine, noted in 1946 of Stevens that "the critics, almost unanimously have praised him," and indeed the reviews of Stevens' exhibitions in the 1940's were glowingly positive. Maud Riley, writing in the Art Digest in 1945, was typical in proclaiming his work to be "an original and arresting contribution to modern art expression." Robert Hale, in Art News in 1946, confidently praised his "highly matured style" as "imaginative, evocative, disciplined, and well sustained." In 1947 Leo Lerman, a writer and editor known for his taste and judgment, writing in House and Garden, called Stevens "the wonderchild of American painting" describing the "anthropological dream-world" depicted in his paintings as the productions of an "instinctive sophisticate." Stevens work evolved and developed subtly over the more than three decades that he painted, however he maintained his own jewel-like fantasy style. The decorative archaism of his work of the 1940's evolved in the 1950's towards a greater range of color and more delicate details as well as subjects inspired by places he had actually visited on his many travels throughout the world. In the 1960's his work became increasingly refined and expressed a crystalline quality with prismatic light and color effects. Stevens continued to exhibit, his works continued to be acquired by collectors and museums, and his shows continued to be reviewed in the important art magazines, however the critics were not always as enthusiastic as they had been in previous years. While the critics in the 1950's still praised Stevens' work, a few reviewers reservedly criticized its decorative quality. The occasional detractor was typified by artist/critic Robert Goodnough, writing in Art News in 1953, who observed that "his technique is based on Persian and primitive painting and frequently the painting is appealing and clever," adding, however, that "often his combinations of ancient methods, plus a washed Japanese-like background, come off as a tour-de-force, rather than actual painting." "Actual painting" in the mid-1950's was becoming increasingly articulated as abstract expressionism, and Stevens' meticulous, controlled method was far removed from the action painting of Franz Kline or Jackson Pollock. Nevertheless, there is a correspondence between Stevens' semi-abstract works of the 1940's with their flattened arrangements of signs, symbols, marks and shapes, and works of the same period by artists who evolved into abstract expressionists in the 1950's such as Bradley Walker Tomlin, Richard Pousette Dart and especially Adolph Gottlieb. A comparison of Stevens' and Gottlieb's respective work makes an interesting study of the divergent paths that art took from the 1940's to the 1950's. In both Stevens' and Gottlieb's paintings of the 1940's, archaic signs and mythic symbols were rendered in a grid format and could be read as either abstract forms or evocative fragments of primitive cultures. In subsequent years Stevens' work became increasingly pictorial, narrative and detailed, while Gottlieb's became increasingly abstract, gestural and reductivist. Abstract expressionism came to dominate avant-garde art production and critical discourse while narrative, fantasy and figurative art had less critical, but more popular, appeal. As Stevens continued to create and exhibit throughout the 1950's and '60's the reviews were frequently less favorable. The change was exemplified by the reviews written by James Schuyler in Art News. 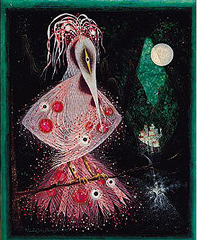 In 1957 Schuyler stated enthusiastically that Stevens' paintings were "rather incredible, like the lavish illustrations (DuLac, Nielsen) of children's books thirty and some years ago. A spun sugar lion is especially delectable." In 1962, in the same publication, Schuyler reversed himself and denounced Stevens work, writing that "the paintings were even uglier, in a pretty-pretty way, than before. He aims at "magic" and it comes off like an out-of-date child's book illustration that was creepy to begin with." Perhaps the ultimate highbrow put-down came from Lawrence Cambell, writing in Art News in 1956, who declared Stevens "the Hoagy Carmichael of painting with a corner on a small segment of moderately exotic experience." Equivocally acknowledging Stevens' skill and sensibility, Campbell added that he offered this exoticism "neatly groomed in a dainty cage of modernism." Despite the critics Stevens persisted in his work as an artist and as a teacher and administrator at the Newark School of Fine and Industrial Art, where he was appointed Director in 1959. Stevens' art persisted in its popular appeal and in 1964 his painting "Desert City" was chosen to be reproduced on a UNICEF greeting card. In 1965 Suzi Gablik, writing in Art News (in the last published review of one of Stevens' exhibitions--but not his last show), seemed to be resigned to his longevity, stating neutrally that the artist "continues to draw his popular imagery from exotic South Americana . . . the florid colors and the ornamental stylizations retain his well-known decorative effects." Although appealing to many, Stevens' art gently drifted away from public notice by the late 1960's. Nevertheless Stevens continued to paint, to travel widely and he found further personal fulfillment in marrying late in life. With the rapidly increasing interest in mid-20th century design there is a growing interest in the art that hung on the walls of mid-century homes decorated in modern style. Stevens' art looks lovely amongst furnishings by Edward Wormley and Dorothy Liebes, but beyond simple décor there are also significant aesthetic and theoretical correspondences between his art and their designs. Their syncretic, multi-cultural modernism is part of the "big picture" of mid-20th century art and design. Stevens' art is unique, in its exquisite aesthetic, but is also part of that bigger mid-century cultural picture. As rediscoveries are made and the art of the 20th century is re-evaluated, inevitably a new generation of admirers will come to appreciate the art of Edward John Stevens, Jr.